Mari has been a member of the Mobius Artists Group since 1980, and works as faculty at the School of the Museum of Fine Arts. For six weeks thirteen high school students worked intensively at the Mobius Artists Space with Boston performance artists Mari Novotny-Jones, Alexia Mellor and LA-based artist and performer GRONK. 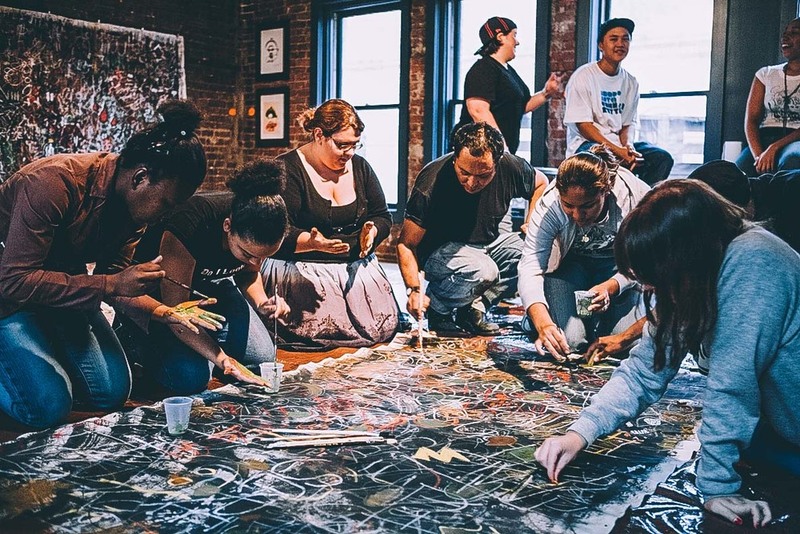 Through performance art, visual art, and intense discussion, Inside/OUT participants explored their own identities, their neighborhoods, and what it means to be an artist in the city of Boston. Both an exercise in community building and youth development and an opportunity formotivated teens to work directly with professional artists, Inside/OUT gave urban young people an opportunity to create sophisticated artwork reflecting their concerns and ideas as emerging members of Boston’s contemporary arts community. Final works included a series of live, interactive performance art pieces, site-specific sculpture installations, and large-scale collaborative paintings.